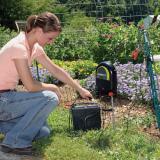 0.5 electric fence energizer with the components to operate it as a battery unit (plug-in capable too). Simply source a DC battery locally, connect the energizer to the fence, and then to the battery. As the battery is drawn down, replace with a fully charged battery and recharge the original. Note: Recommended for up to 3 rolls of poultry netting or for up to 5 rolls of garden/sheep/goat netting. Will power 1 mile of 3 strand cattle fence, 1/2 mile of a 5-7 strand sheep fence, 6 of the 164' sheep/goat nets and 3 of the 164' poultry nets. All distances are dependent on amount of grass/weed load on the fence. Draw from a 12v battery is 42 milliampere (mA) per hour. 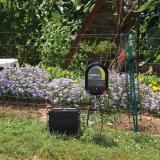 With this energizer a 12v 100 ampere hour, deep cycle battery will last approximately 59 days* on a clean or a weedy fence. *Assumes being drawn down to 40% between recharges. 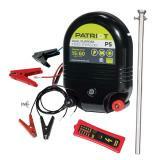 Can use a 6-10 Watt solar panel with the Patriot P5 (not included in the kit). 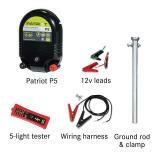 Patriot P5: Versatile, can be used as a plug-in energizer or as a battery energizer. Adapts from one style to the other in a few seconds. Easily moved around. Low cost. The Patriot P5 can be mounted either inside or outside of a building or on the modified ground rod that comes with the kit. Make sure that there is no risk of fire wherever you decide to locate it. The energizer must be mounted vertically. 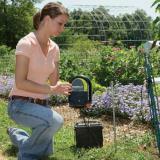 Protect the energizer from direct rainfall or flooding. Plug 12v battery leads into bottom of Patriot P5. Patriot P5: Make sure the energizer is unplugged before working on the fence or the energizer. When using a 12v deep cycle battery, there is no case to protect the battery, so the battery will be exposed to the elements and risk of theft. This unit is not modular, therefore it is not repairable. 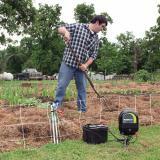 Ground rod: When installing more then one ground rod, space the ground rods apart 2 feet longer than the rod. Example 3' rods should be spaced 6' apart. After losing every ear of corn to a family of raccoons last year, we bought the raccoon netting and this energizer. Wasn't sure this would keep them out, so far so good! Our corn Is tasseling and producing ears! So glad we made this investment! The netting is so easy to install, the energizer was a breeze! Highly recommend to keep the critters out of your garden! Easy to install and simple to use. Full charge on the fence on uneven ground. I plugged it into a surge protector with an on/off switch. I've used this product for almost one year without incident. When the unit failed, I sent an e-mail and within an hour I was advised how to narrow in on the problem. It was the plug in cord. I received replacement cord within 2 days. Can't beat that! I've ordered a 12 v battery as backup just in case. Of course I'm sticking with Premier One due to their outstanding service, but I may try the wide impedence energizer as I add to the flock. A good unit for small enclosures. Works great so far - keeping chickens in and dogs out. Using on 2 full poultry netting panels. I have it plugged into AC power because my battery just doesn't seem to give enough juice to get the 3000v needed. I love the tester too - very easy to use. Energizer works great but the tester is poorly made. This is our 3rd Patriot and our last two testers we had to re-solder. I sent an email to premier but they never replied.